In keeping with the motto ‘reliable and efficient’, MAN is presenting a newly developed 12-cylinder V-engine for use in working vessels at the SMM 2014 trade fair in Hamburg, Germany. The German engine manufacturer will thereby extend the power range of its high-speed marine engines for heavy-duty operation up to 735 kW (1,000 hp). The MAN marine engine seamlessly integrates into the company ethos of optimum efficiency and premium product quality. The D2862 LE441 is MAN’s 735 kW (1,000 hp), 12-cylinder V-engine for heavy-duty operation. By adapting the turbocharger and the valve timing, MAN was able to raise the mean pressure and increase the power rating by 73 kW (100 hp) compared to the most powerful engines available until now: the D2862 LE431 and D2842 LE421, which are still available. The new, efficient MAN marine engine D2862 LE441, with its increased power and a dry weight of 2,270 kg, offers an excellent power density for heavy-duty applications such as tugboats and freighters. With a capacity of 24.24 l, a bore of 128 mm and a stroke of 157 mm, the powerful MAN marine engine can achieve a maximum torque of 4,380 Nm at 1,100 to 1,600 rpm. The MAN D2862 LE441 proves particularly efficient if the costs over its en-tire life cycle are taken into account: even with a specific consumption under full load at maximum torque, the 12-cylinder engine has an outstanding minimum consumption of 192.3 g/kWh. Furthermore, it features oil change intervals of 600 hours and average overhaul intervals of 18,000 operating hours. Individually mounted cylinder heads also ensure ease of service, which allows MAN’s solid power unit to shine when it comes to cost-effectiveness calculations. The engine foot positions and installation dimensions are identical to the previous series, making it ideal for engine upgrade projects. Compactly scaled at 2,124 mm x 1,153 mm x 1,289 mm (length x width x height), the 735 kW MAN twelve-cylinder engine has an outstanding power density. The new D2862 LE441 is the latest addition to the reliable MAN engine range: years of experience with engines and in-house development, design and production at the International Engine Competence Center in Nuremberg, Germany, ensure that MAN marine engines are of the highest quality. The D2862 has also passed numerous field trials and measurements with flying colours. All customers are safe in the knowledge that they have re-ceived the high quality standard that they expect from MAN because every MAN engine which is produced is subject to a trial run. The overall picture of reliable and efficient MAN marine engines is rounded off by the type approval of the D2868 and D2862 marine engines by various classification societies. 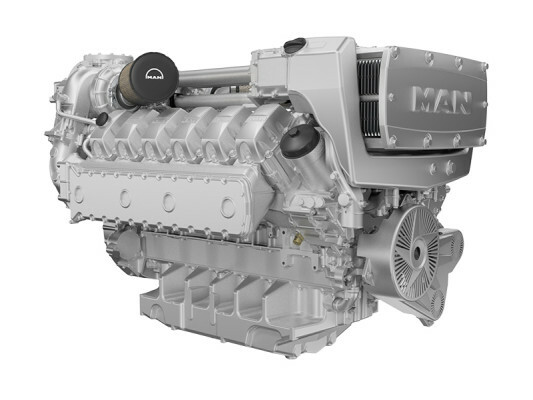 MAN offers its entire product range of new common-rail engines for commercial and leisure sailing in EPA Tier 3. The new 735 kW (1,000 hp), 12-cylinder engine too is therefore available in the currently applicable emission standard as the D2862 LE444. Both engines – D2862 LE441 and D2862 LE444 – can be ordered from now on. The D2862 LE444 can be seen at the SMM trade fair in Hamburg from 9 to 12 September 2014, in Hall A3, Stand 200.